Samarthanam Trust has well-established programs across a wide range of social causes: education, women in distress, disabled youth, nutrition for children and environment-friendly waste management. The purpose behind the Trust’s diverse mix of outreaches is to holistically create an inclusive society, through elimination of discrimination, providing educational support to children and disabled youth, and creating job opportunities for visually challenged individuals. Samarthanam Trust has been able to grow significantly over the years, building partnerships with government and corporate entities through strategic advocacy and fundraising efforts. 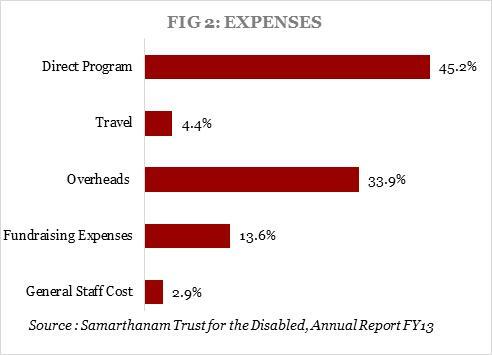 Samarthanam Trust’s programs reached out to 9,000 beneficiaries in FY13. 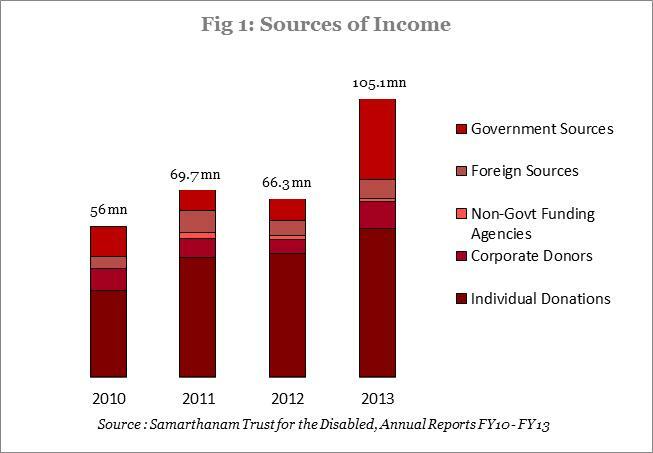 Increase in Total Income: Samarthanam Trust received a total income of Rs105mn in FY13, which is a considerable increase of about 59% over the previous year’s income (ref: Fig.1). This increase can be directly attributed to the large amount of funds raised to organize and host the “T20 World Cup for the Blind”, which was a goodwill event held in collaboration with the World Blind Cricket Council, for visually challenged individuals from 9 participating countries. The cost of the event was approximately Rs27mn, which was largely sponsored by various government ministries and public sector organizations. The funds raised by the Trust for its general programs (i.e. apart from the T20 event) increased by 18% in FY13. It is currently not certain when Samarthanam Trust will be required to host the T20 event in the future, as this depends on the decision by the World Blind Cricket Council. Corporate and Non-Government Funding Organizations: Overall, the funds raised from corporate entities (Rs10.2mn) increased by around 52% over the average of the previous three years (FY10-FY12). Around 41% of these funds were for the purpose of the T20 event, excluding which, income from corporate sources towards general programs increased by around 15% over the previous year. On the other hand, income from non-government funding organizations has been on a steady decline. Funds raised from this source amounted to Rs1mn in FY13, which is less than half the amount raised in FY11 from the same source. Foreign Sources: FY13 witnessed an increase of around 27% in foreign donations towards programs, particularly from individuals and online portals. Additionally, the Trust received a large contribution of Rs7.5mn towards its building fund for construction of the new school, from a US-based multinational company. This reflects the Trust’s improving abilities to raise funds from various types of foreign donors. Income from Government: Due to continuous advocacy efforts with both State and Central governments, Samarthanam Trust has been successful in steadily increasing its funding from government sources. Funding towards general programs in FY13 increased by about 14%, amounting to Rs9.3mn. Additionally, funds of Rs22.7mn were raised for the T20 Cricket World Cup for the Blind from government ministries and public sector undertakings. Individual Donors: The Trust’s largest source of funding, however, still remains individual donors, which formed approximately 52% of its total funds raised in FY13 (69% in FY12). Surpluses, Reserves and Investments: Samarthanam Trust has sizeable surpluses carried forward every year, the surplus in FY13, for example, being Rs14.4mn. These surpluses are usually added to the Trust’s reserve funds. Total general reserves accumulated till FY13 amount to Rs44mn. The Trust additionally has an earmarked reserve titled “Building Fund” with a balance of Rs25.3mn as on FY13 year end. The fund is to be utilized for the construction of a new residential school for visually challenged students. Large additions (Rs9.5mn) were made to this fund in FY13, largely from one foreign corporate donor, and the rest from various Indian corporates. However, the Trust’s cash/bank balances and investments are much lower in comparison to its accumulated reserves: investments as at FY13 year-end stand at about Rs1.3million and cash/bank balances at about Rs4mn. Not counting the funds attributable to other current assets (Rs7.3mn) and grants receivable from the Government (3.5mn), the balance funds appear to be deployed in the considerable amount of fixed assets acquired by the Trust over the years. Fixed Assets: As at FY13 year end, Samarthanam Trust has a total fixed assets balance of Rs79.4m. Additions in the current year amounted to Rs44.6m, being mainly land and building purchased for a new school (Rs27.7m) and building under construction for the school for the visually challenged (Rs16m). It may be noted that of the total balance of fixed assets, 91% (i.e. Rs72.2mn) can be attributed to immovable assets in the nature of land and building. General Overheads: Expenditure in this category has increased significantly over the recent years, from Rs13.5mn in FY11 to Rs27.3mn in FY13 (not including depreciation, travel and administrative staff costs). The increase in FY13 can be attributed to expenditure on overheads for the T20 World Cup for the Blind (Rs14.7mn), which although being separately sponsored, formed a large part of the overheads charged in FY13. Depreciation: This increased by 73% over the depreciation charged in FY12. This is primarily a result of the Rs1.4mn depreciation on the land and building purchased during FY13. Professional Fees: Expenditure under this head (audit fees and legal charges) has also approximately tripled in FY13 (Rs0.12mn), owing to the increase in scale of operations of the Trust. Fundraising Expenses: Samarthanam Trust outsources its fundraising activities to call centers, mainly for the Vidyaprasad (mid-day meal) program and the Tech Vision projects (employability training for disabled youth). The charges for these services are the reason for the high expenditure incurred on fundraising. There has been a marginal drop in the expenses incurred in the past three years, coming down from Rs14mn in FY11 to Rs12.3mn in FY13 (12% decrease). Travel Expenses: Travel expenses in FY13 were almost Rs4mn, i.e. over 5 times that in FY12. This is owing to the travel expenses of Rs2.2mn incurred during the T20 World Cup for the Blind. Loans: Samarthanam Trust has a large quantum of loan liabilities, amounting to Rs25.4mn in FY13. A major part of this is the “Building Loan” of Rs19.4mn taken from a co-operative bank purchase of the new school. The loan will be repaid over the course of 10 years. Income Growth Rate (IGR): The IGR, which measures the increase in income year-on-year, was at a very high 59% in FY13 due to the increased funding for the T20 World Cup for the Blind. The total income growth rate has not shown a specific trend over the past four years (Ref: Fig.1), although income from government and individual sources is on a constant increase. Self Sufficiency Ratio (SSR): The SSR measures the NGO’s ability to cover operational expenses from income sources other than organizational donors (who support only in the short-medium term), such as individual donors, sales, investment income, etc. Samarthanam Trust had a fairly healthy ratio in the 75-80% range in FY11-FY12, however, in FY13 it dropped to 63%. Although individual donations increased by 20% in FY13, the drop in the SSR can be attributed to the relative increase in funding from government and corporate sources. Going forward, the SSR is likely to increase again, as the quantum of individual donations towards regular programs keeps increasing as per past trends. Corpus Funds: The Trust has a negligible corpus fund of Rs0.45mn (FY12: Rs0.1mn). This is very low considering the size of the Trust. Building the Corpus Fund: Although the Trust’s ability to raise funds for programs and events is fairly effective, there have been difficulties in building a corpus fund. Reserves are also being utilized for the new schools and other infrastructure. This is a concern for the Trust. Increasing Scale: The Trust has a target to raise Rs1bn by 2020, to support a wide-scale outreach. While they have started working on strategies to target government, corporate and foreign funding, they are still formulating the strategy to increase funding by around 10 times in a span of 7 years. The Board of Samarthanam Trust is chaired by Mr. Mahantesh G.K., who has also founded BCare, an organisation for the support and rehabilitation of HIV/AIDS patients. Mr. Mahantesh has also received several high-profile awards, including the Aryabhatta International Award, the National Award from the Ministry of Child Welfare, the Vajra Kumar Prashasti, the Karamveer Puraskar and the NDTV Sports Lifetime Achievement Award. The co-founder, Mr.S.P. Nagesh works for the State Bank of India, and also serves as the Vice President of National Paralympics Committee of India. In 2010, he received the State Award for services in the field of disability. Samarthanam Trust received the Governor’s Award for Excellence from the Government of Karnataka in 2002. Disclaimer: Users should note that HelpYourNGO does not verify or endorse any of these projects and is not liable for any inaccuracies in the data presented. The data on the web site is merely for your information and any action taken based on the information on this website is at your own risk. To give away money, you need to make money. HelpYourNGO is supported by Equitymaster.